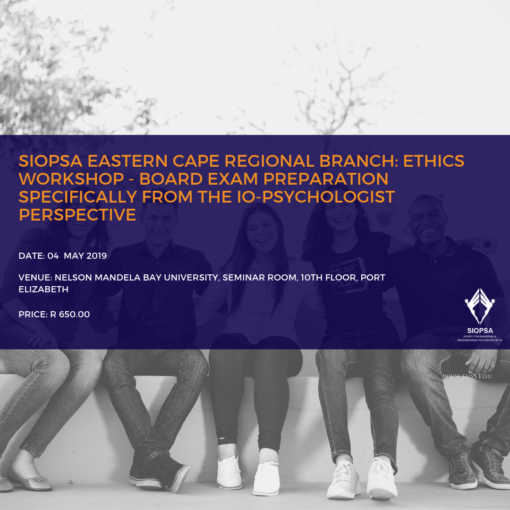 We would like to invite all intern IO-Psychologists, registered for the Board Exams, to come and attend a preparation workshop with the intent of exploring one’s ethical conscience and uniting it with the Ethical Best Practices in IO-Psychology, as monitored by the Health Professions Council of South Africa and the South African Legislation. This is also a workshop designed to better equip current IO-Psychology Interns with the knowledge and background to ethical scope and application of practice. Is an industrial psychologist who focussed on further understanding the discourses governing one’s expression of values across cultures. She has functioned as the PTA SIOPSA Foundation Lead, lecturer in IO Psychology and HR-practices and consults in Assessment, Development and Psycho-legal practice. During the workshop she will focus on translating theoretical ethical principles into practice through providing a rigorous exploration around one’s ethical foundations and experiences gained during the IO-internship, to ensure confidence is instilled when addressing ethical conundrums. Is an industrial psychologist who has explored the reported system which governs expatriate experiences through acculturation in South Africa, and has extended her passion within the assessment and development field. Alice is the SIOPSA Pretoria Branch’s representative for emerging psychologists and has a vested interest in growing the IO Psychology fraternity with a strong foundation for the future. Alice has lectured in IO-relevant statistics and is an Assessment and Development Specialist. During the workshop, she will focus on creating a space for creative and courageous thinking – when addressing ethical challenges based on her IO-foundation of knowledge and consulting experiences. Relevance to the Emerging Psychologists (IOP Interns). 1) Receive a work-booklet before the event, to effectively prepare for the workshop sessions and ensure that your knowledge us being transferred into practice 2) The core knowledge of the workshop lies in the prescribed board exam material, which will be covered through in-depth theoretical sessions as well as ethical case studies that are provided for practice 3) The workshop will allow you to craft your own ethical decision-making framework and will allow you to explore how you can articulate your decision in a way that considers legal, ethical and best practice principles in the field of IO-psychology. Late bookings 10% late booking fee. Delegates that arrive on the day without proof of payment or booking, will be expected to complete a registration form and sign the signature list.